Now, businesses connect with their customers through their various online touch-points. A stable content management system that incorporates the entire content landscape of an organization and smoothly integrates with manifold systems has become the need of the hour. 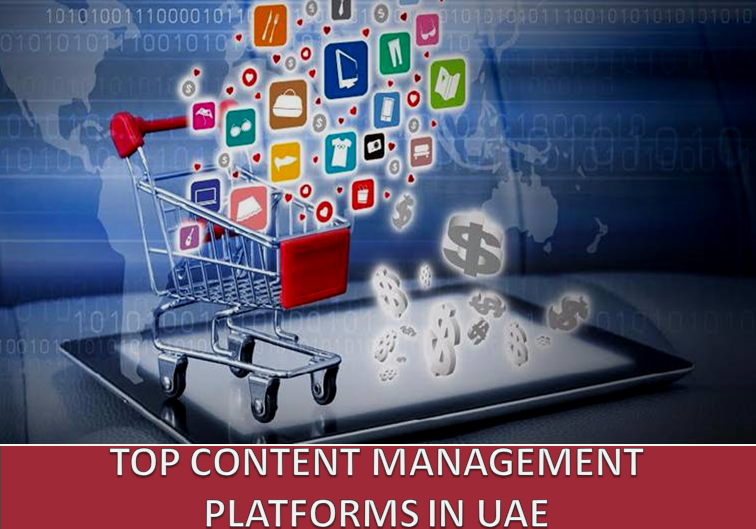 Recently, the UAE has seen a boom in the sale and adoption of several CMS platforms – from WordPress to Web Page Maker. The popularity of a CMS always rests on various factors like business requirements, the overall setup cost, implementation time, manageability, etc. From our analysis, we arrived at the fact that WordPress is the most commonly used CMS platform in the UAE with 81.46% websites using it. The remaining 18.54% market share is divided among the 30 others. Adobe Muse is at second in lead with 2.32% market share, and Microsoft Sharepoint and iAPPs, secure the third and the fourth positions respectively. The below table shows you the breakdown of the CMS-Website correlation. WordPress dominates the landscape with 81.46% (8466) businesses using it. WordPress has been around in the web development domain since 2003 and still holds sway over the whole idea of a simple Content Management System for a business. From personal blogs to professional e-commerce websites, WordPress helps realise your dream of owning a website without having to invest much. Using a WordPress web design makes web development easy, cost-effective, functional, secure, simple, SEO-friendly, scalable and what not. It allows you to customize your site with the numerous plugins it offers. Another attribute exclusive to WP is that this open source platform gives you a strong community support as well. Ever did you imagine that you could build a website yourself sans coding knowledge? More than a CMS, Adobe Muse works as a website builder, tailor-made for designers especially, who have the passion to create brilliant-looking websites. Adobe Muse comes in second on trend, holding 2.32% of CMS market share. There are 241 websites built on AM. The UI being similar to Adobe’s designer programs such as Indesign and Photoshop, it brings convenience of use to designers helping them shift their focus from programming to designing. Even newbies can either seek help from Muse’s dedicated community or learn from the brilliant tutorial videos available in the kit. But what might pose a challenge is the absence of ready-to-use themes; you are just given a blank canvas and you will have to design everything from scratch. Another added advantage is that Adobe Muse allows you to merge your albums, or blogs on tumblr or wordpress. Microsoft SharePoint seizes the third position with 1.34% market share. As a CMS, Microsoft’s SharePoint is pretty easy to use in a layman’s perspective or for those who are already familiar with Microsoft Office suite. It is an excellent choice when you have a lot of content (word docs or pdfs) to archive, manage and share. But this again calls for a careful mastery over taxonomy, which can become cumbersome in time. As a member of Microsoft family, it integrates easily with their Office suite. It can be used as an intranet in your organisation. It makes your site more secure not being open source but that again throws a challenge to find a good support community. With 136 businesses using it, iAPPS comes in the fourth among all. Suiting all sizes of business, iAPPS’s flexible interface even facilitates admin management using mobile phones or tablets. It works on the latest HTML5 technology, so your website can host any type of rich media content. The platform also allows for a fluidic integration with third-party apps, thereby giving you all the liberty to share content between various platforms. However, their UX and support base need a bit of improvement. Others comprise of 27 CMS platforms including Joomla, Drupal, Umbraco, etc. They together own an average market share of 0.50%. Note: This statistics is not based on the reviews of CMS users. 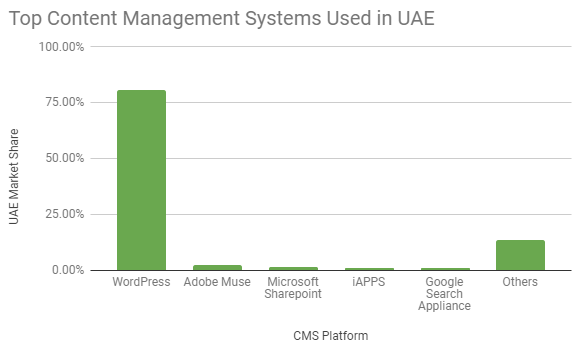 We have just presented the most widely used CMS’s across the UAE, based on our research. Each of these Content Management Systems offers their own specific features. While WordPress allows for easy customization, Adobe Muse gives you a design platform to explore your creativity. WordPress is the most widely used CMS platform in the UAE acquiring a lion’s share of market. But, this doesn’t mean that you should also go for WordPress as your content management system since everyone is using it. Before choosing a CMS, you need to understand your business needs and budget. For instance, factors like price can sometimes lure you but the real cost of a CMS happens post purchase. A CMS that requires exhaustive coding is not good bet for a small business as it unnecessarily overshoots the implementation time and cost. Therefore, it is always good to consult a web designing agency to choose the right CMS for your business.